Curvelo is a small town two hours drive from Belo Horizonte. If there's no road construction that is. Our way back took 4 hours due to repairs on a bridge. It is a large Quartz producing area and has a few adjacent villages, like Corinto, where Quartz is also mined and polished. This area is one of my favorite places to go. It is where my father finds the treasures inside Quartz (Inclusions). It is not as easy as it sounds though. Sometimes we have to go through thousands of kilos of material to find a few pieces of interesting material. Once we find something interesting, we have it cut or polished to make the inclusions very visible and aesthetic. The cutting process is carefully followed by my father to insure it is cut properly. 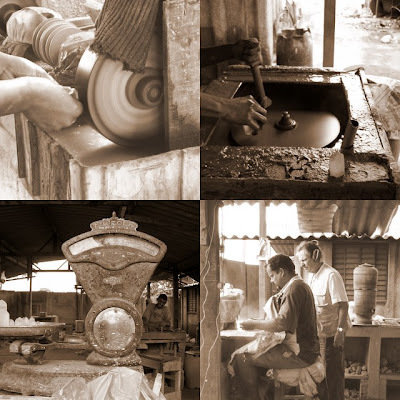 The picture below shows one of the places where our pieces are polished. Note the last photo where my father stares attentively as the cutter saws one of the pieces. We have just cut really great Quartz pieces with Tourmalines inside and some with Pyrite. I am bringing lots of new inclusions along with some minerals that rank really high on the cuteness scale. Now if you love spheres, this is your place. The best sphere makers are in Curvelo. When we find large enough pieces of unusual rough material, we have them cut there. We are making some Garnet ones at present that will be ready for Denver. Can you imagine the shipping cost? I am glad there were no inclusions!